Nithya Dhyaan is a 35-minute meditation designed by Nithyananda to unclutch from the mind and move beyond it. It cleanses and energises the vital energy centers or chakras in the body, which are responsible for the swaying emotions and stored negative memories. It brings intense awareness into the system to awaken the inner intelligence. The meditation causes an experience of a growing explosion in consciousness that can steer a person towards a life of totality and completion. Nithya Dhyaan is a technique that gives a seeker what he needs to balance himself and be in complete harmony with his body, mind and spirit. It enables him to harness the inner intelligence and to excel in the inner and outer worlds. Please be seated in a yogic posture called Vajrasana. Sit on your mat on the floor with both your legs stretched out. Next fold both the legs, one after the other at the knees and rest your posterior on your heels with your toes turned outward. 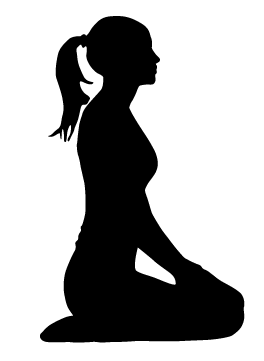 This is Vajrasana. With open palms, place your hands on the thigh joint where it meets the hips, with your thumb pointing backwards and the remaining four fingers pointing forwards as if you are holding your hips. You can use a cushion or a rolled towel under your ankles. Sit comfortably with your head, neck and spine in a straight line. Now close your eyes and breathe chaotically for 7 minutes. Breathe intensely and non rhythmically. Your entire upper body should move as you breathe. However, do not over-strain yourself. If you have had a recent surgery or have a medical problem or if you are pregnant, please do this step carefully, with the level of intensity that feels comfortable. Continue to sit in Vajrasana. You now need to form the ‘chin mudra’. A mudra is a symbolic gesture of the hands and fingers. Place your hands on your knees. Your hands with open palms should be facing upward. Let the tip of the index finger touch the tip of the thumb, as if forming a circle. The three other fingers, arms and the hands remain relaxed. Now, hum intensely for 7 minutes. Breathe in deeply and as you exhale create a humming sound from your navel. Your mouth should be closed. You will feel a vibration starting from your lips and mouth. Be relaxed. Do not strain yourself. If you have had a recent surgery or have a medical problem or you are pregnant, please do this step carefully, with the level of intensity that feels comfortable. For 7 minutes just be unclutched in silence. Be a witness to whatever is happening inside you and around you. Do not suppress your thoughts. Do not follow your thoughts. Just watch your thoughts as an observer. For the last 7 minutes remain in a deep mood of gratitude. When your whole being overflows with gratitude, you commune with the existential energy. You may chant the Guru Pooja Mantra or just listen to the mantra and offer your gratitude to Existence and to your Guru. Offer your gratitude with your whole being.